Plenty of pineapple at the floating market. I took one Vietnamese class during my junior year of college, the only time such a class was available at any of the schools I’ve attended. I remember feeling frustrated at all the time and emphasis spent on the six Vietnamese tones or accents. I wanted words! I wanted to understand things! The tones just seemed like semantics. Plus, they are really difficult for a self-conscious speaker with a thick tongue. But in a tonal language like Vietnamese, the tones are the key to understanding and (correctly) saying anything. It’s not enough to learn the general shape of a word, the pattern of consonants and vowels strung together that make one word distinct from another. This approach, which helped me learn English and Spanish, doesn’t apply here, where the same word can have six different meanings depending on its tone. So it’s back to the basics of inflection for me. Many of the Vietnamese words I’ve accumulated until now revolve around food. I’m pretty solid on fruits (at least, common fruits in the US), but for the life of me could not remember coconut or pineapple. Now I’ve realized it’s because the words are spelled exactly the same, with only the accent mark and the inflection of your voice to tell the difference. Pineapple = dứa, and coconut = dừa. Oh, and to make it more fun, the “d” is actually pronounced like a “z” if you’re from the North of Vietnam, and like a “y” if you’re from the South. Keeping all that straight? During a floating market tour in Can Tho, we walked through a garden with a pineapple tree (plant?) growing near a coconut palm. Our fellow tourists from Germany expressed surprise that pineapples grow out of the ground. That’s it, I thought. Pineapples (dứa) grow up from the ground and have an up inflection, while coconuts (dừa) fall down from the tree and have a down inflection. Never mind that I could just use another word for pineapple (thơm) that sounds nothing like coconut. I was pretty proud of myself for that one. But creating mnemonics for every Vietnamese vocabulary word? Fat chance. So it’s back to my little book, hoping that writing things down will help me recognize and remember new words. I need to sort and catalog them into different mental bins for the different tones. Learning to read, write and speak a word all at the same time seems like a tall order, but I’m realizing I can’t really do one without the others. The only way I’ll be able to navigate this language is knowing which way the tones go. 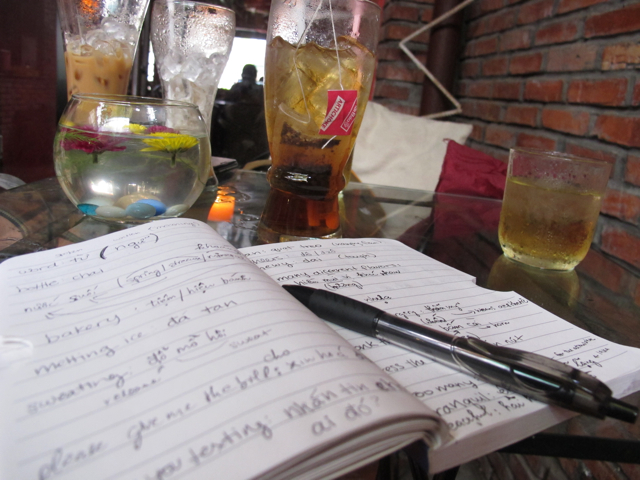 Writing it down….Photo by Bao Quan Nguyen. An unlikely teaching aid. “Get the lottery results live by mobile phone.” Photo by Bao Quan Nguyen. Teaching aids come in some varied and unlikely forms on my quest to learn Vietnamese. Two of my favorites are signs and advertisements. Big, bold words and short phrases have a better chance of sticking in my brain—manageable chunks I can decipher and digest. And for someone as slow to learning Vietnamese as I am, the repetition of common signs is a blessing, like roadside flashcards. Thus, I’ve learned that the ubiquitous signs for “rửa xe” mean “car wash.” This is often paired with the conveniently rhyming “sửa xe” or “car repair.” Except, in this country “car” refers to a motorbike more often than not. 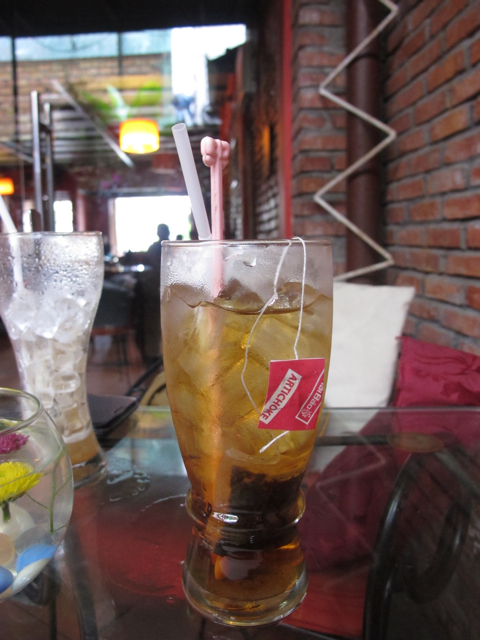 My other big language aid is my cousin Quan, who traveled with me to Can Tho. I tend to pepper him with questions over meals. What does this sign mean? How do you say this? What did you just say to that person? It takes a lot of effort from both parties, but when we’re both feeling up for it, the language exchange is quite fun. When I’m really on top of it, I whip out a little book to write the words down, hoping this will cement the connection in my head. The spoken language just washes over me in waves of rising and falling tones, which I can’t yet decipher with any consistency. So I cling to the written word, the printed word, as something tangible I can wrap my head around at my own pace. 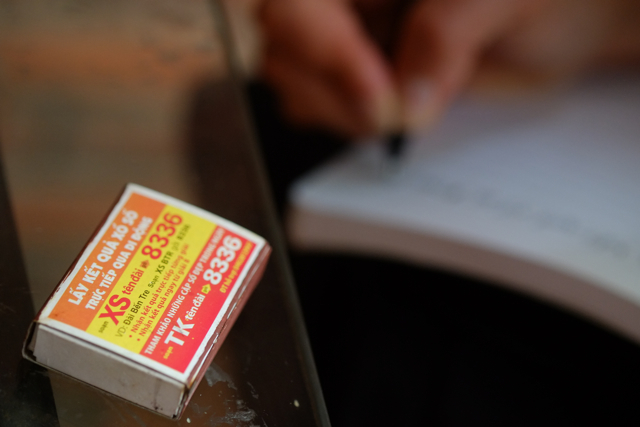 During a visit to a café, I pounced on a matchbox sitting on a nearby table. What luck! What a trove of new words at my disposal! Thanks to Quan, I now know that the matches are high quality, and I can get the lottery results directly on my mobile phone. Fun language connections sometimes ensue from learning new words. 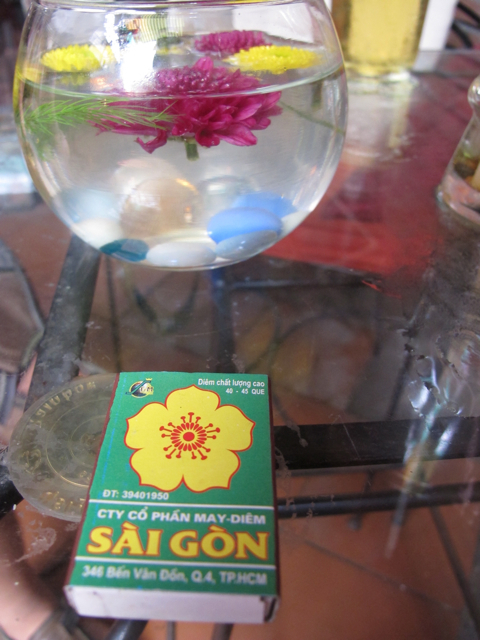 For instance, the bowls of water and flowers made me ask about the word for “float,” which is nổi. That reminded me I had already heard the word in the term “floating market”(chợ nổi), which we had visited earlier. And that lead my cousin to tell me about the expression “Ba chìm, bảy nổi,” which literally means “Three (tenths) sinking, seven (tenths) floating.” It’s something you say when someone asks, “How are you?” Kind of like saying “so-so,” but with the relative ratio of bad to good. (You can also switch it around and have “Seven parts sinking and three parts floating,” if things aren’t really going your way.) I’m so tickled by the mathematical preciseness of it. Ratios! In pleasantries! 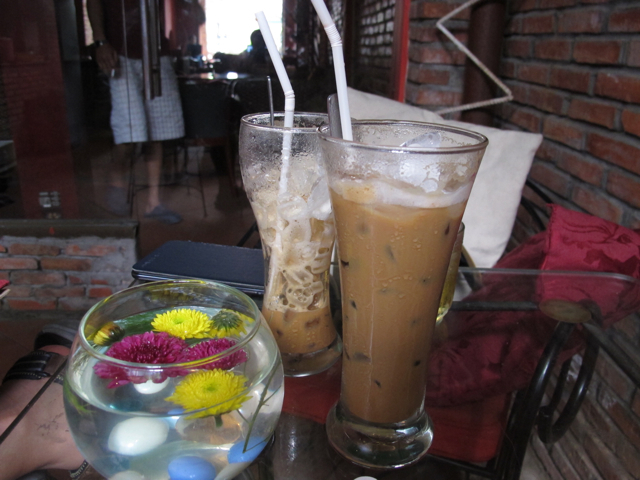 It wouldn’t be a true Vietnamese coffee shop experience without Vietnamese coffee, so we ordered some. The coffee, which is often served with condensed milk, is incredibly strong and sweet. It’s really delicious, but for someone like me who usually goes easy on caffeine, it can bring on palpitations. So I switched to tea. Quan recommended I try a flavor called “atiso,” which I had never heard of. To my surprise, the tea bag set in front of me read, “artichoke.” The tea had so much sugar that my sweet tooth was singing, and made it hard to tease out the true taste. Something that sugary couldn’t help but be delicious, although I think the flavor would be pretty pleasant on its own. I’d give it a hearty endorsement for the next artichoke festival in Castroville. Why has this not already caught on in a big way?